Hello. probably a silly questions but how do I add a Page Break to my report. I need to print Terms and Conditions on the back of my quotes so how do I ensure a breaks occurs before the T&C's so it prints on the back of the page? 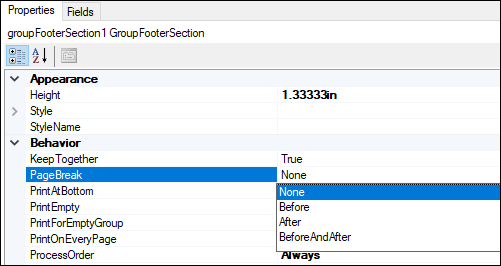 Hopefully you have a Group section in your report. If so, there is a PageBreak option that you can use. I would set it to Before. Are you using the HTML or PDF version of the report? It's a PDF version. I'm guessing that makes a big difference? Hmmm, I was hoping you would say HTML. PDF usually handles the rendering better. Can you attach the .rpx file here? I can see if I have the same issue as you in my environment. I have attached the .rpx file. I think the problem might be that you have your Conditional of Sale in the pageFooterSection1 area which causes it to print on every page. 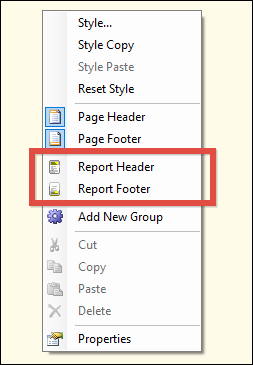 If you move it to the reportFooterSection1 area, then it should only print at the end of the report. When I open up the template I do not see the reportFooterSection1. Did you add that section? Is it something I can add to the template? It's not so intuitive unfortunately. To enable the section, you can right-click anywhere in the white area, then turn it on. Thanks Tim. Finally got there! Thanks for all the tips! Awesome! Glad you were able to get it working.